I have always said that textiles have power. They not only symbolize power as in military uniforms or papal vestments, but they have an inner, intrinsic power. One of the powers that textiles have is eliciting emotions from viewers and, naturally these emotions are individual. Another power of textiles is that the cloth can have different meanings depending upon circumstances. An excellent example of this is Arpilleras. 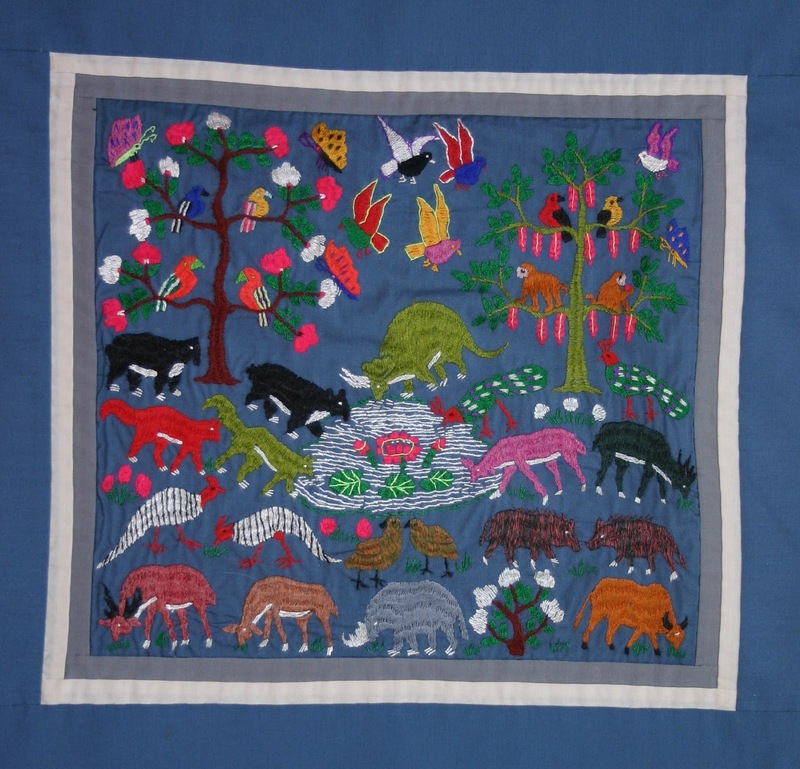 Arpilleras are handcrafted, appliquéd cloths depicting village life, scenes from nature and, sometimes a fantastic assortment of surreal plants and animals. The name comes from a word that means burlap, the cloth often used as backing material. 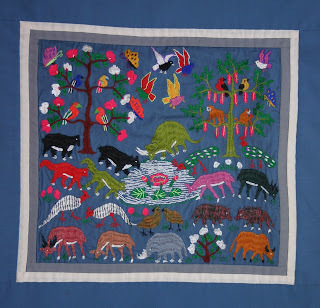 The images are created from cotton cloth of vivid colors and accented with contrasting threads usually in stem or straight stitch, occasionally in blanket stitch. The composition is definitely not to scale, plants and flowers larger than houses, children leading small llamas or tending large sheep. In Peru the arpilleras feature stuffed human figures that are clothed in native style dress and carry baskets, flowers or bags of grain. These 3 dimentional figures are sewn onto background that has already been appliquéd with buildings and landscapes. The quality of workmanship varies considerably from elaborate vignettes with much embroidery and added details to plainer cloths with raw edges of the applied fabric apparent. So what emotional power do these patchwork pieces possess? When my husband and I travel we try to take time to visit beyond the large cities, spending a day driving through the country and visiting, if we can small towns and villages. Sometimes we are lucky to catch a market day, festival or religious procession. We have even come across a wedding and actually were invited to join the outdoor celebration. So when I saw and acquired my first arpillera I was joyfully reminded of these travel adventures. However, in researching these textiles further, I was surprised to find that this sentiment of bucolic village life was not universally shared. 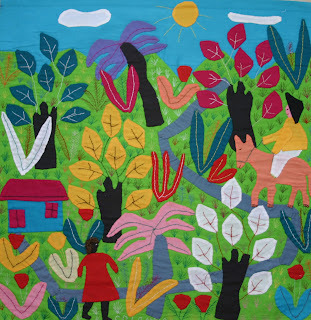 You see the women that create them are nearly all very poor, their families depend upon the extra income generated when the arpilleras are sold. So some believe that they represent a difficult life, not the pleasant scene under the large South American sun. Perhaps the most different meaning attached to these cloths comes from Chile. While there had been some use of narrative handwork used to express political and social dissatisfaction in the 1950’s and 60’s in Chile the events of September 11, 1973 (yes, it seems that 9/11 is a fateful date) saw the military takeover by General Pinochet of the government and the years of terror that followed. Thousands of Chileans thought to be unsupportive of the regime were taken from their homes and were made to disappear. The simply ceased to exist and their families had no recourse. The wives and mothers of these “detained and disappeared” were left in extreme poverty. Many turned to workshops, often sponsored by churches to create handworked pieces, which were then sold. The women used the arpilleras to tell their story. In more muted colors, their loss and demands for justice were stitched. Often scenes from a home depicted empty chairs around the eating table or the names of the missing family members. Today, arpilleras (also called “cuadros” in Peru) can be found in many South American tourist areas. Regardless of how we interpret their meaning, they are a truly views into the lives of their makers and voices of their thoughts and feelings.